Allspice comes from a tree in the myrtle family that grows in Central and South America. It is an evergreen which grows to about 30 feet (9 meters) tall and its glossy, aromatic green leaves reach about 6 inches in length. 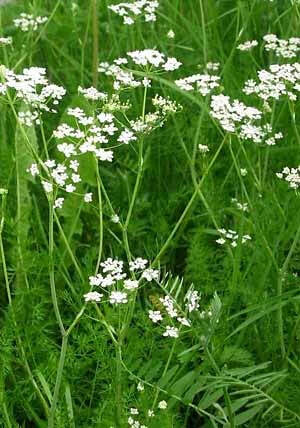 Small white flowers, and later the berries, green at first, then purplish-red, grow in clumps. All spice can be burnt as an incense for the attraction of Money and Luck. 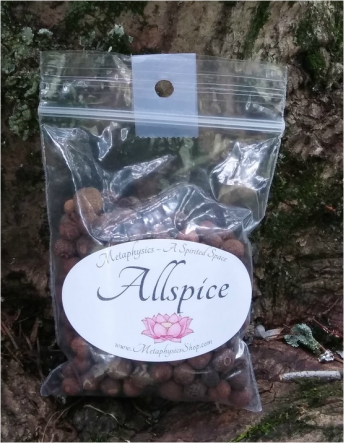 Allspice has very uplifting properties, and is great in healing spells and mixtures. It adds a very positive component to aid in healing. ​We are currently growing our own Bay Laurel due to the versatility and power of this little Shrub. We use the leaves in a variety of products to aid our customers. We choose to grow our own Bay Laurel, as we can harvest the leaves and dry them in time honored ways to ensure the utmost in purity and energy. From the blessed water we use to nurture the trees growth to the prayers and blessings we weave into the harvesting rituals, every step is taken to ensure the leaves will have the utmost essence. Bay Laurel is an evergreen shrub (often referred to as a small tree) native to Asia Minor and areas around the Mediterranean. Bay Laurel's scientific name comes from the Latin Laurus meaning "verdant" and nobilis meaning noble, or of high rank. It has shiny oval leaves, pointed with dark green on top with a lighter underside. Flowers, which appear in clusters in the spring are yellow and are followed in female plants by small black or purple berries. In the wild it can grow up to 60 feet tall, but cultivated outside its native habitat it only reaches 3-10 feet in height. Bay Laurel Crowns were given to kings, heroes, triumphant athletes, poets and other great men and women to signify their greatness in both ancient Greece and Rome. Bay Laurel wreaths were worn for their protective properties. Doctors also wore laurel as it was considered helpful in curing nearly everything. Modern day medicine has discovered Bay laurel has verified bactericidal and fungicidal properties. Laurel is sacred to Apollo and is an appropriate decoration for any altar to him. Its spicy fragrance and association with the sun makes it appropriate for any festival of the sun. Bay laurel is also associated with Aesclepius, Ceres, Zeus, Fides, Hermes and Cerridwen. It is considered masculine, and is ruled by Leo, the sun and the element of fire. In the Celtic Wheel of the Year, this herb is associated with Imbolc, celebration of midwinter. This herb laid in stored food or clothing help repel bugs. It can also be added to sachets to keep moths out of your closets. A bay leaf dropped in a bag of flour may also help keep bugs out of that. Bay leaves are protective of the home and person (when worn as an amulet). Harvest the leaves as needed once the tree is established. This is one herb that's better dried than fresh, as the fresh leaves are much more bitter. They may be pressed to dry as you would press flowers. Properly dried leaves are bright olive green. Store them in darkness in an airtight container. Throw them out after two years, or when they turn brown, whichever comes first. The plant can be propagated easily from cuttings. This herb is sacred to Apollo and the Archangel Michael. It is said that the Oracle at Delphi chewed the leaves and inhaled the smoke when seeking visions. Inhaling the scent of these burning leaves is said to help increase psychic ability. It is said that if you write a wish on a dried bay leaf and then burn it and your wish will come true. This works best if they are burned on the full Moon to empower the wish. Uses - Bay Leaf — for victory, triumph, and success. Warding off Evil. Laurel wreaths may be worn by healers during healing ceremonies and while treating the sick in order to increase the positive healing energy and protect against negative energy that may be hanging around the sick room. Bay leaf can also be burned in the sick room after the illness has passed to purify it and drive out any residual sickness vibes. When you finally get rid of that roommate, ex-spouse or family member who you thought would never leave, sweep their footsteps out the door with a broom and then smudge the house with bay to ensure they won't return. Even if you aren't really happy about them going, if you know it's best for everyone, cleanse the home of their presence for closure. Bay laurel may be carried to protect against any number of misfortunes and to bring luck in athletic competitions. To ensure that you will see your lover again, and neither of you will be tempted to infidelity, go together to a bay laurel tree and pluck a leaf, break it in half and each keep one half. Folklore says that growing bay laurel as a houseplant will protect your home from lightning strikes and disease. Bay leaf is exceptionally useful as a smudge during banishing and exorcism rites, especially those involving poltergeists. Mixed with sandalwood, it is useful for breaking curses. Bay leaves may be added to any spell or potion designed to enhance psychic ability and is a great addition to a psychic dream pillow. Many carry BAY LEAVES in mojo bags to stop interference by unwanted people. Place one dried BAY LEAF in each corner of a room to Avoid Being Jinxed. Dried BAY LEAVES can also be used as a floor sweep by sprinkling them onto the floor and then sweeping them out the front door. Make BAY LEAVES into tea and add it to their regular floor wash to get rid of Jinxes and Enemy Tricks laid on the door-step. Soak this herb in orange blossom water and then dry them to add a nice muskiness to their fragrance for potpourris. They are also a key ingredient in traditionally made Archangel Michael packets and sacred to Archangel Michael. The essential oil can be added to massage oils for arthritis and muscle aches and pains. It can also be added to salves for bruises, itching and other mild skin irritations. A poultice of the leaves and berries, simmered till soft, can be placed on the chest to relieve head and chest colds. A tea made of the leaves and/or berries aids in digestion, helps to rid the body of impurities and makes a good general health tonic. It is particularly helpful to women who are having trouble urinating after childbirth. Pregnant women, however, should not use bay laurel beyond the little bit we might use in cooking. Tea can also be used to calm nerves. 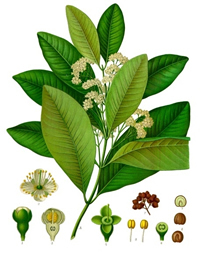 Adding bay laurel to your bath tea aids with vaginal infections, perinatal healing after childbirth and urinary tract infections. Bay Laurel is sometimes called Daphne because of the ancient Greek story featuring Apollo. The nymph Daphne was the daughter of the earth, Gaia, and the river, Peneus. She admired the goddess Diana and like her, enjoyed the woods and hunting. She refused all suitors and wished to remain unmarried, as Diana did. Her father supported her in this. Apollo fell in love with her, but she did not want him. The more he pursued her, the more she ran from him. When he was about to catch her, she asked her father the river for help, and he turned her into a bay tree. Apollo said that if he could not have her for his love, he would have at least the leaves of the tree to decorate his harp and wear as a crown. That's why in ancient times, crowns for military victors were made of bay leaves. Associated with Fire and Mars, very masculine in nature. Properties: Love, Health and Healing. Use for love potions when you want someone, but are not sure who. Use in love sachets and spells. Add to warm wine to make a lust potion. Can be hung in home for protection. Protective of gardeners and all in their households. Powdered and used as an incense, will promote peace between people who are unable to get along. Throw instead of rice at handfastings and/or add to the handfasting cake. ​Associated with Fire and Mars, Very masculine in nature. Sprinkle each Sunday across doorways before noon on Sunday to attract peace and tranquility. Mix with Frankincense and burn as an incense for protection and to drive out evil. ​ Use in love spells, especially ones that promote fidelity. ​ Cumin seed steeped in wine makes a lust potion.